This is a short-term review since we received our test pair of the Countdown 6 (CD6) from Down Skis in late February 2013, and subsequently lost weeks and weeks of testing due to bad snow and weather conditions, which finally gave way to a couple quick weeks of great skiing in late March before things melted down completely. We did not get a the time on the CD6s we wanted. but we got enough days in different conditions to get a short-term review written up. Stay tuned in December 2013 for updates on our experiences with the CD6s....(which are updated for 2013-2014). Simen Stori (Norway) and Gregor Gieras (USA-Switzerland) and a group of testers in Norway, Sweden, Italy, Austria, France, and Germany. "The “6” is ideal for those lighter skiers who want a full-grown, one-ski-quiver or those looking to complement their “2” with a more pure touring ski that has the same basic feel. We have taken the proven DNA of the “2” and tinkered with it to make an even more versatile and touring-friendly ski. This ski can handle everything and be handled by anyone to become the one quiver ski you have been looking for. We not only shaved off 4 centimeters from the length but also 250+ grams per ski to make this a ski you can take from resort to backcountry. Our unique, tapered tip and tail combination eliminates hooking and instability while slicing through anything in its path. A moderate amount of shape and sidecut, coupled with a medium-stiff flex achieves a balance that makes this ski a true all-mountain, all-conditions performer. Ski fast in any conditions, play around on features, float in powder, carve trenches on the piste." I would have to agree with the CD6 description on nearly all points. 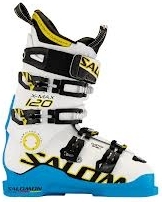 They definitely have an addictingly spry, light, sporty, quick feel and have excellent agility in tight or manky conditions, with no hint of hooking or instability other than a slightly unanchored feel at high speeds on hardpack surfaces (this ski is aimed at more off-piste conditions, where it excels, and should not be considered a dedicated groomer-zoomer by any means). I would disagree with "...carve trenches on the piste. ", unless the piste is somewhat packed-powder or softer in consistency. I think dedicated carving skis "carve trenches", while all-mountain skis or skis biased toward off-piste tend to merely "carve tracks". The CD6 is definitely an all-terrain ski, with a wide variety of excellent response and athletic handling traits in all but truly nasty boilerplate conditions. The combination of a 25 meter radius and very lightweight chassis makes the CD6 a ski you can ride for hours in all kinds of conditions and terrain without straining, and the carbon-rich layup provides a responsive feel without any hint of nervousness or "ping" sometimes seen in other carbon constructions. The CD6 definitely seeks the off-piste more than frontside groomers and shows its highest performance "in snow" rather than "on snow", but is completely predictable and fun getting to and from the lifts with authority and security, making some really nice turn shapes on demand with very little effort. One thing that constantly came to mind with the CD6s is the remarkably low level of effort it takes to handle them in variable or "wild" snow conditions in the woods, open areas, streambeds, flats or steeps. They never fight back and always give you control quickly when needed, while giving you a fun ride. If there was any new snow (good or bad quality) dumped on our Green Mountains overnight, I grabbed the CD6s as one of the two or three "go-to" pairs of skis for uncertain conditions from our test fleet, leaving the others behind...that should tell you how we felt about these skis. The remarkably light weight was especially nice when hiking the skis to and from different places. Tyrolia SP120 demo bindings, Mounted -8 per recommendation from DOWN. The CD6s came out of the bag nicely finished, with a great matte finish topsheet and simple, clean graphics that grow on you more and more as you live with them. If you want a flashy, screaming-skulls and technicolor explosion look on your skis...look elsewhere. They have a definite "high-tech" look. Hand flex is moderate or medium stiffness throughout the ski, with a fairly round, even pattern front to back. Torsional stiffness feels neither soft or stiff to hand-flexing, but progressively stronger from tip to mid-body, with fairly stiff torsional strength at the tail. Fit and finsh were excellent, and the pair was nicely matched both physically and graphically, with only 5 grams weight difference between each ski. The first impression upon seeing the skis was "...this is a ski that can go anywhere. It's not a special-purpose design." Tip and tail taper and rocker profile was moderate, with a definite bias toward front-end float and relatively tight tail finishing shape. Eastern corduroy, packed powder and hardpack groomers, ungroomed packed powder with small bumps, shin-deep to knee-deep powder conditions, both smooth and bumpy. Windpack, crust, chalky wind buff, fresh and old powder, weeds and brush...lotsa trees). Based on the few weeks we had to test the Down Countdown 6 skis, I personally found them to quickly become my favorite choice when the snow was variable or the terrain tricky. The other ski that had this effect on me was the Praxis Concept, but in a different way. The Praxis Concept is a wider, more "platform-like" ski, while the Down CD6 is more of a "precision-like" ski. The Concepts are more floaty and drifty, while the CD6s are more surgical...but having the same result of making traversing odd or variable conditions ridiculously easy...it just depends on what feel you want underfoot that day. The folks at Down have had a couple seasons to refine their models since launching the idea and original designs back in 2006, getting several years of prototype testing from 2009 through commercial release in 20011. The feel of the CD6 gives the impression this ski was designed and refined to behave exactly as it does. That might sound odd, but that's the impression I get from this ski. I define "hardpack" as a surface that allows cuts less than a few millimeters deep when you carve a ski hard into it, but definitely shows "ski tracks". I define "boilerplate" as a surface that essentialy shows no marks when you carve strongly across it. The CD6 behaves like an all-mountain ski with a shorter radius than its 25 meter specification would lead you to believe since it starts and finishes turns so easily. It's not a dedicated hard-surface carving tool, but leaves excellent turn shapes on hardpack with very few calories burned by the pilot, It's quck and easy to change direction on demand. Turn radii can be adjusted during the turns with very little effort. The faster you go, the more you notice the very lightweight nature of the skis. While never "squirrely", they feel less and less "planted" on the hard surface as you approach speeds that get the attention of ski patrolers nearby. This is normal with nearly all lightweight skis, and as any racer will tell you, a nice, heavy ski setup (ski, binding, plate) can give a sense of security at high speeds on hard surfaces. The CD6 feels very light compared to most skis in its category, and while there is always control at speed, I felt they were less and less planted on hardpack as speeds climbed up and up. Vibration dampening was moderate, neither too little or too much, and the quick responsiveness of the CD6 made it feel very lively on hard surfaces. On boilerplate, the CD6 showed its only real weakness: it does not carve like a race ski...it feels like a very light all-mountain ski or touring ski when you get it on bulletproof surfaces. It does not loose control or directional integrity...it merely signals it is not enthusiastic about holding hard-pressure carving trajectories across boilerplate. It looses a bit of grip in the forebody at the rocker point, and the tail can give way gradually if pressed too hard at too high a speed on intensely hard surfaces. If you switch from GS carving-mode to a more punchy SL style on the boilerplate, the CD6 behaves more confidently, with plenty of energy and edgehold underfoot to get directional changes finished with little effort. We could have tuned the CD6 to track better across boilerplate, but would have lost the great pivoting and slarving ability by flattening the base bevel too much and going sharp tip-to-tail. Overall, hardpack behavior was very good, just not race-like or unusually great for a ski in this category. Mixed snow types and surface consistencies is where the CD6 shines. The first day I took the CD6s out, it was a mix of ancient frozen-thawed-refrozen base with some wet, heavy snow skied out in all directions, topped with a few inches of fresh, dry snow. Tricky was the word of the day, and the Down CD6s felt like I was dancing over the odd and variable depths, densities and underlaying material in all kinds of tight, open, smooth or bumpy terrain. The lightness was immediately apparent and addicting, requiring very, very little effort to start, hold or finish turns or directional changes. Scrubbing speed was very easy, as was dodging oddities in the terrain or surface consistencies. Contrasted with some skis which float-and-stomp their way over such conditions, the CD6s encouraged precision targeting in, over, next-to or across anything in my path. One of the nice things I found with the CD6 was the ability to really enjoy precision placement of each ski exactly where I wanted it without worrying about it deflecting, washing-out, twitching or otherwise misbehaving. I could put the skis exactly where I needed them to be, then apply as much or as little pressure as needed and get exactly the behavior I wanted over and over....all with very little effort. The CD6 does not need or want a heavy-handed pilot, and rewards a precise technique with excellent feedback not only underfoot, but along the entire length of the ski. There is a great feel and high-degree of non-intrusive communication from these skis in wacked-out or variable terrain or surfaces. Fun fun fun. Did I mention they are lightweight and responsive? Bumps were easily navigated either bouncing along their tops, or slithering in the troughs. The component layup of the Down CD6s provides a lively and controlled rebound and gradual resistance to compression which makes it easy to get them in and out of bumpy terrain quickly. No hint of tip or tail hangup, even in somewhat heavy snow conditions in bumpy terrain. They have excellent agility and ability to reset after mistakes without feeling like you're being taken for a ride without your consent. I had some of my best runs in knee-deep powder bumps in the trees with the CD6s. We were lucky enough to have some epic Nor'Easter powder dump weather during the last couple days of testing, with tons of runs in 18-20 inches of fresh pow at Magic Mountain, Vermont (one of our favorite old-style ski areas left in North America). Despite their 127-107-121 dimensions, the CD6s feel like they float like wider, fatter skis because of their flex and rocker design and light weight. I found they could surf the top layers of snow easily, yet you could drive them down into the snow a bit to slow down, dropping your depth as needed, and bring them back up to the surface with slight weight or pressure change, doing a nice porpoise impersonation as needed before, during or after turns. "Adaptive" is the word I would use to describe the Down CD6 powder behavior. Since they are 107mm underfoot, they do not have the massive floatability of dedicated specialty powder skis at warp speeds, but they would make anyone totally happy on any powder day you might run into. You can throw them sideways (thanks to the tapered tip and tail and moderate rocker) to scrub speed or avoid obstacles, smear a bit at the entry to some tight spots, drift them or set them into a tracking mode with minimal effort...always producing a high confidence factor at all but the craziest speeds....and do it all day long...that's a big plus. This is one of the most fun, light-feeling all-terrain skis you will find...and at preseason prices of €349...a huge bargain. It's not for heavy-handed, bullish skiers who might overpower it. The CD6 rewards a balanced technique and craves quick-footed terrain. Fun, fun fun and very little effort for high-performance skiing. Seriously consider the CD6 with AT binding setups and head off-piste for touring, but get yourself a good heel-locking model for downhill resort runs for lift-serviced frontside fun. Alpine bindings would be great too...but you will miss some of the great sidecountry behavior this ski can deliver. 5' 11", 180 lbs. 53 year-old expert, "old-style" race inspired, "foot steerer" with fairly sensitive edging feel. Loves to hold long arcs with lots of pressure on the downhill ski (you know the type), but also loves the feel of both skis on-edge leaving tiny railroad track edge tracks. Loves powder when it's not tracked out. Trees and odd terrain angles are fun. What a great review on what appears to be a great ski. One question: You mention that you test ski had "low camber", whereas the down ski website indicates "flat camber". Do you know is this is a change in the 12/13 vs the 13/14 model? Any thoughts on or experience with the Countdown Carbon 7?